This being the premiere blog on this subject by you lowly author, I think it is proper to frame the discussion a bit so as not to raise too many expectations, nor lower morale with unrealistic hurdles that may have little or nothing to do with the skill and art that’s practiced and daily demonstrated by the hardest working and most dedicated group of professionals we know as “Pet Groomers”. Few dedicate their time, compassion, and sometimes their health and wellbeing to such a high extent as these professionals. My respect for these warriors of the “Bathing Tub”, “Drying Station“, and “Grooming Table” comes after 45+ years servicing their product and equipment needs as a Pet Supply Distributor and Manufacturer. Hopefully observing their trials and tribulations, listening and observing their challenges and advocating for better equipment and product solutions; healthier less stressful work environment for both groomers and pets; and raising the profession to the higher plain it deserves will have mostly positive effects. Hopefully, all who follow this blog will develop a better understanding and appreciation for what it takes to “Groom”. 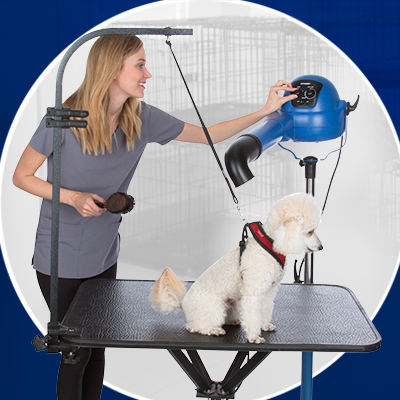 “A Pet Groomer” can include a variety of people from “Professionals” who earn their living providing services in commercial Grooming Salons or Shops either at stand alone, commercial locations or within “Brick and Mortar”, Pet Stores, Chain Stores or in “Self-Wash” facilities that additionally offer full service grooming services; as well as mobile grooming vehicles or trailers that arrive at a client’s home at an appointed time; or by traveling groomers who provide in house services and transport their own equipment. They may begin learning their trade at a Grooming School; or other curriculum based study course; or individually under the guidance of a working Professional Groomer; or through simply learning on the job as a part of a related occupation or vocation where animal upkeep, care and proper grooming standards are expected and practiced. The other noteworthy realm of “Grooming Practitioners’ is the “Dog Show” groomers who may be a Breed, Show Handler; a Dog Show fancier; or perhaps the Show Dog’s Owner. Since Grooming “Certification” and “Standards” have not been universally applied across the globe, this blog will not attempt to navigate nor resolve the many issues that have arisen over the years. My only interest in this arena is to discuss subjects that emphasize health, safety and the grooming experience that affects our animal friends, their parents, and the groomers themselves. It is my desire that this blog, with your considerable help, be a lively, open discussion of the subjects presented and that every reader and participant gains further knowledge of how we all can make the human/animal bond; natures truly, great success story. What tools, products and related items to consider before you start the grooming process? Short hair coats, long hair coats, double coats, cotton coats, no coats, and terrier coats. Discussion of and how to groom for the best results. What to consider when selecting from so, so many brands. What tool or equipment is indispensable to the grooming process? And many, many more. Suggest what subjects you want discussed.